When the company discovered that the reserve of natural gas was 70 percent carbon dioxide-the primary greenhouse gas and a main driver of climate change-it abandoned the project, Bernstein says. After spending almost a year reviewing a wide range of internal corporate and trade association documents pried loose by leaks, lawsuits and Freedom of Information Act (FOIA) requests, UCS researchers have compiled a broader tale of deceit. “Natural resource companies – oil, coal, minerals – have to make investments that have lifetimes of 50-100 years”. While many compare the case to the tobacco industry denying the dangers of smoking, she argues “this is an order of magnitude greater moral offense, in my opinion, because what is at stake is the fate of the planet, humanity, and the future of civilization”. It did question – legitimately, in my opinion – the validity of some of the science. “I am here to talk to you about the present”, he said. The company has since reportedly invested millions in climate change denial. “We have been factoring the likelihood of some kind of carbon tax into our business planning since 2007″. The government is inviting the public to attend a forum next week on the review of its air-quality objectives after consultants unveil initial results that will map out a strategy. The forum will be held on March 20, a day after lawmakers are to be briefed by the consultant. An expert group that has steered the review since 2007 will also meet tomorrow to discuss the results. Clean-air advocates have said environment officials will probably stick largely to their previous proposal of adopting what critics have described as standards for beginners. Hong Kong has been applying the same air-quality objectives for 21 years without review, lagging far behind the latest World Health Organisation guidelines, issued in 2005. “We do not expect the consultant to come up with recommended standards very different from what has been mentioned before,” a source close to the expert group said. Chief Executive Donald Tsang Yam-kuen said in his last policy address that the city would adopt a set of minimum interim targets as a first step towards the ultimate targets. He also said the proportion of electricity generated by natural gas would be increased to at least one-half. The source expected officials to make minor adjustments to these interim targets, such as tightening the limits on respirable suspended particles in the air. The consultant will release findings on the cost and projected health benefits. One of the review’s key stakeholders, CLP Power, reported yesterday that its emissions of key pollutants dropped between 16 and 30 per cent last year, as it expanded natural-gas intake from its Hainan reserve, raising its share in the fuel mix from 23 to 28 per cent. Its carbon emission also fell 8 per cent. Meanwhile, in a “green boat” project in collaboration with the University of Hong Kong’s department of mechanical engineering, a leisure junk owned by insurer Aviva has become the city’s first vessel to run on diesel, mixed with 5 per cent of bio-diesel refined from waste cooking oil. It was also retrofitted with solar panels and a micro-wind turbine to power electrical devices on board. Researchers said bio-diesel could help cut smoke emissions by 10 per cent. They hoped to eventually test an engine that runs 100 per cent on bio-diesel and a new smoke-reduction device for the boat. 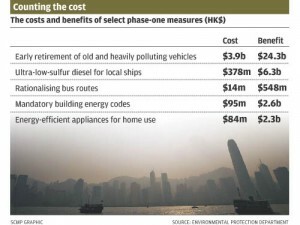 Simon Phipps, managing director of Aviva, said the retrofit cost of hundreds of thousands of dollars was minimal compared with the health costs of doing nothing to tackle air pollution.